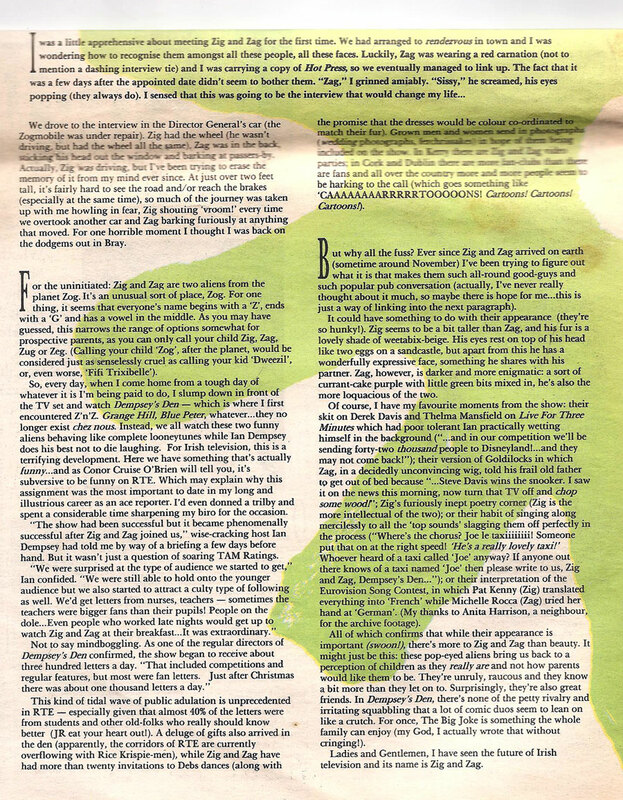 Lots of intersting things in this issue of Hot Press from July 1988. 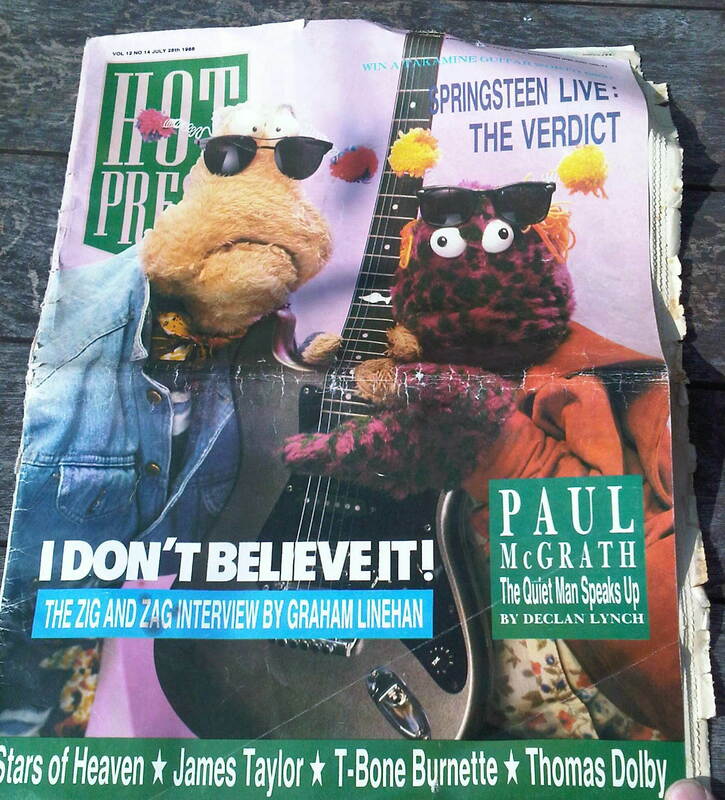 The reason I still have a copy is because of the Zig and Zag interview but there are a few other interesting articles which I’ve linked to at the bottom of this post. I was a big fan of Zig and Zag in the late 80s. They had a breakfast radio 2 slot with Ian Dempsey and hosted the kids afternoon TV show, Dempsey’s Den. No podcasts or Youtube back then, so you had to catch it live. 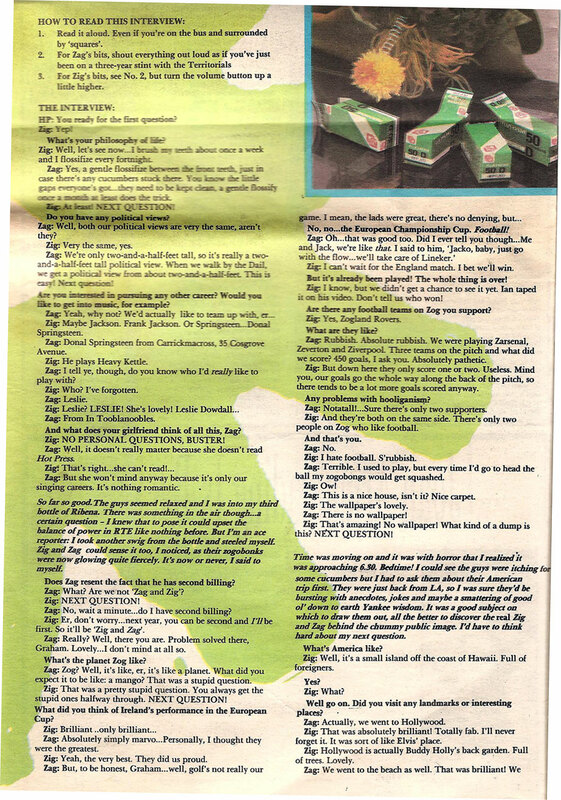 It was a big deal for me when they used a couple of my gags that I had posted into them, on their AOR radio slot. In the summer of 1988 I saw them do a brilliant live 90 minute performance in a punch & judy style box in Stephens Green as part of Dublin city Millennium celebrations. It was free in, it was a warm day and I don’t know how they kept going inside that wardrobe like box for so long, providing loads of spontaneous laughs. Mind you, I don’t think they did any ‘live’ shows after this. I really admire how the 2 guys from Zog, though their names were known, retained their anonymity. For example, I remember hanging around after that Stephens Green show with friends, but we never saw the guys actually come out of that punch & judy box! They always had a trick or two up their sleeves (!) to protect their identity at awards ceremonies and the like. Last year my wife bought me their DVD which had clips from their RTE TV shows. I sat down to watch it with my kids but…… it didn’t work and we couldn’t get into it at all and never finished it. Having said that, my kids love & read their books, remember “Fridge in a Denim Jacket”? If you want to read the article/interview here are the links. page 1, page 2, page 3, page 4. 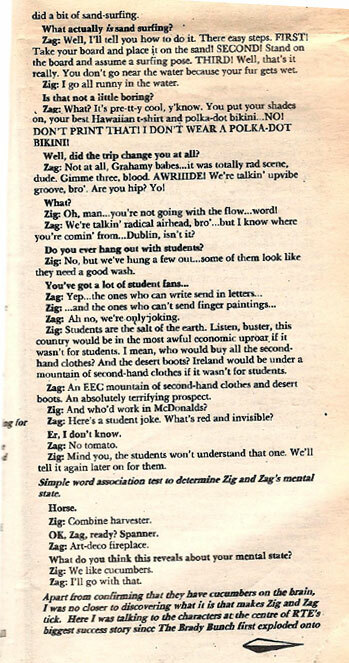 Also by Graham Linehan, from this same issue of Hot Press, was a piece on Dublin band Stars of Heaven with pics by Conor Horgan. I’ve scanned 2 further pages from this issue of Hot Press. 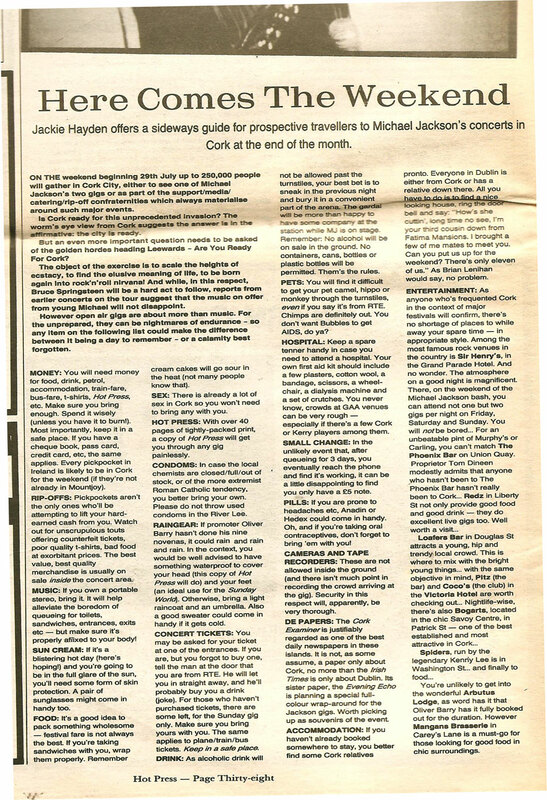 The first on the left is some tips from Jackie Haden about visiting Cork ahead of the Michael Jackson gig there. Pubs/Clubs like Sir Henrys, Phoenix, Redz, Loafers all get a mention. 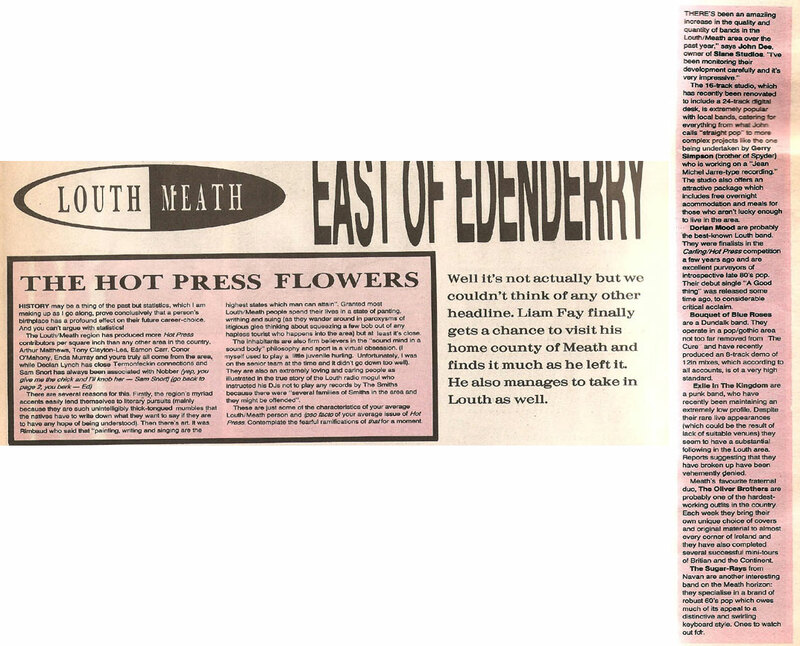 The second scan is from an article by Liam Fay about the Louth/Meath area. 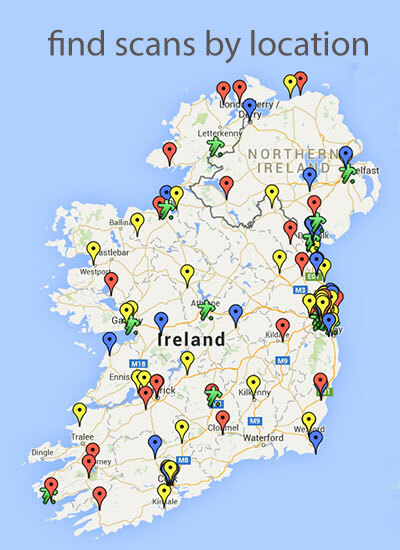 Some local groups (Exile in the Kingdom, Dorian Mood, Bouquet of Blue Roses) and Enda Murray get a name check. Click on either image below to read the articles. Hey! Thanks! That was one allright!